Home system. You can set up your own Wi-Fi router in your home, connected to a wired cable modem or DSL modem. Although you could make the service completely open to anyone, a better choice is to require users enter the system key you set. Once the key is in place on a NOOK Color, NOOK Simple Touch, or other wireless device, it will be able to connect to the system anytime it is within range of the router. Office or organizational system. A Wi-Fi system in an office, library, school, or other organization can be made open to any authorized user who is given the system key (and sometimes a login name). Open system. Coffeeshops, libraries, stores, and some local governments have created free Wi-Fi zones that require only a login, without need for a key. Owners of a NOOK eReader will find they have free and unfettered access to a Wi-Fi system when they bring their device into a Barnes & Noble retail store. Pay sites. In some locations (including airports), companies sell access to the Internet on an hourly or subscription basis. You may need to set up an account beforehand on a laptop or personal computer, or you may be able to enter credit card details from your NOOK Color; use your judgment for whether the operator is worthy of being entrusted with your card number. A better option: pay cash to purchase a time-limited password. To turn off the NOOK Color’s Wi-Fi networking, tap on the right end of the Status Bar to open the Quick Settings dialog box, then slide the Wireless switch to the off position. 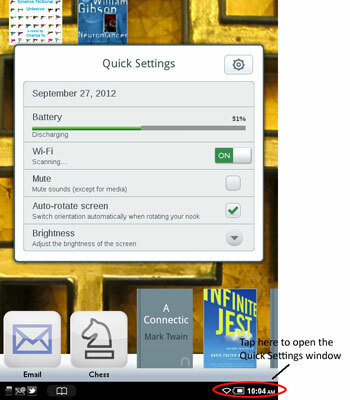 Tap anywhere outside the Quick Settings dialog box to close it. Do the same, choosing the on position, to re-enable Wi-Fi. To connect to a Wi-Fi network, press the ∩ button, tap Settings, and then tap Wireless. The NOOK will scan for available Wi-Fi networks. Tap the network you want to join, and then supply a login name and/or password as needed. The name of the system. It may be a personalized name or that of a café or public site. Or if the owner hasn’t bothered to assign a name, you’ll likely see the name of one or another Wi-Fi router manufacturer, like Linksys or Netgear to name just two. The strength of the signal. This is represented as a stack of curved lines; the more dark lines, the stronger the signal. A strong signal generally means that communication will be faster and more reliable. Whether the signal is open or locked. A lock symbol informs you of the need to enter a password; if you don’t know the password, you may be able to obtain it by asking the owner of the system. Some passwords are permanent and will be remembered by your NOOK, while others may be temporary, with a time limit. Shop for reading material. Visit the NOOK Store to purchase or obtain books, magazines, newspapers, and apps. Participate in social media. Send recommendations, ratings, or quotes to friends using Facebook, Twitter, or Google. Loan or borrow books using LendMe. Registered account holders of a NOOK can lend or borrow certain books they own, granting permission using the facilities of the NOOK Store. Obtain software updates. Barnes & Noble will make available updates or fixes for the operating system of its eReaders as necessary, delivering them wirelessly to your device. Browse the Web. Visit nearly any site on the Internet for research, entertainment, or shopping. Some websites may be set up to deliver a scaled-down “mobile” version of their pages, which may or may not be an improvement when viewed on the NOOK Color. Send and receive e-mail. The NOOK Color includes a built-in e-mail application that works with most types of accounts. And you may also be able to access Web-based e-mail services from the browser.